Black Lamp, from Rainbird Software, is an arcade adventure starring Jolly Jack the Jester who must free the kingdom of Allegoria from evil times. The kingdom's peace and prosperity had been guaranteed by magic lamps that are now missing, and you, as Jolly Jack, must find the lamps. Complete this task and King Maxim will grant Jack his dream of marrying the princess. (Jack is not a handsome fellow, so he takes this chance very seriously.) You control Jack using the joystick, mouse or keyboard. Allegoria is full of monsters that will attack Jack on sight as he searches for the lamps. Fortunately, Jack was given a belt buckle that fires bolts of pure magic. He also has five magical lives and gets another life after every 100,000 points. The monsters, who come at Jack constantly, range from ugly green trolls, vampire bats and goblin soldiers to spitting witches and an evil knight called the Slayer. There are also swarms of dragonflies and wasps that swoop down and attack Jack. All these adversaries can do different amounts of harm. The worst are the dragons; the least dangerous are the swarms of wasps and dragonflies. Jack can defeat all his enemies pretty easily with his magic bolts. But his enemies are so numerous that he can quickly become overwhelmed. Thus the use of strategy in staying out of harm's way is an important part of winning the game. The missing lamps come in different colors and are scattered all around Allegoria. When Jack finds a lamp, he can pick it up by walking over it. It is then displayed at the top of the screen. If he walks over another lamp while he is holding one, he trades lamps. Jack must put one lamp of each color in each of the 20 storage compartments. The black lamp is the most important. It is always guarded by a winged fire-breathing dragon. The dragon breathes fireballs at Jack with unerring accuracy and does a lot of damage quickly. Jack must hit the dragon in every part of its body with magic bolts, turning it black. Once the dragon is dead, it drops its lamp, and Jack can then safely pick it up. When Jack recovers all the lamps, he saves the kingdom and wins his lady's hand. The game then goes on to the next level, which is faster, has more lamps generally and more black lamps guarded by dragons. The kingdom of Allegoria is a vast and varied place. Each time you play a game, the locations of lamps, buildings and objects are different; so there is no pattern to be learned. Jack walks left, right, forward and backward through doors, gates and other openings. He climbs up and down ladders, on top of crates and other objects, and jumps through the air. You have to think in several directions at a time to get back to that blue lamp you needed or to find that storage compartment you passed two screens ago. Jack might have to climb up a ladder, jump over a gap in the floor, exit right to go to another room, then face forward at a doorway (marked by white dots) and walk outside. I've played Black Lamp extensively, and I'm still finding many buildings, streets and rooms I've never seen before. While Jack is adventuring through Allegoria he is under nearly constant attack. His energy level is displayed in a bar graph at the bottom of the screen, as well as by the number of lives left (represented by baubles that look like scepters). If his energy reaches zero, he loses a life. If he loses all his lives, he disappears in flames with a surprised look on his face. Scattered throughout Allegoria are objects that will help Jack in his adventures. Musical instruments give him a high "bounce factor"—that is, if he jumps from a great height he won't die. If he collects five jewels, he gets a temporary shield that protects him from hits. If he collects a weapon, Jack can fire magic bolts that will dispatch any enemy with one shot. Food and drink are also to be found. They give Jack more life energy, very important to his continued progress through the adventure. The background scenery is also varied and sharp. Jack hops along through villages, entering buildings in his search. He may walk out into the countryside, where there are only trees and fences with inviting gates or paths. (There is occasionally a body hanging from a tree. Remember, the kingdom has been taken over by evil.) He can also enter a castle and go exploring its many labyrinthine rooms. Black Lamp comes on a single-sided disk with a clear and informative instruction manual and a quick-start card that briefly tells you how to load and play the game. The manual also describes Jack's opponents, how dangerous they are and how many points you get for zapping them. I enjoyed playing Black Lamp, but after a while it began to feel like many other maze and ladder games I've played, such as Jump Man. 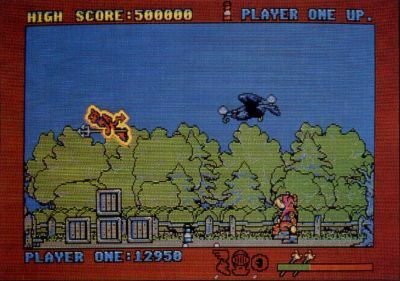 This type of game is not new, but Black Lamp does manage to far outdistance these earlier games because of the size and complexity and the variety of Jack's enemies. With its eye-popping graphics and fascinating animation, Black Lamp stands out as an accomplished addition to the arcade-adventure game genre.